Working out whether it’s worth waiting for Godot relies on a clear reading of what’s happening to wage growth. One factor that influences this is the changing composition of the workforce. In the short-run one of the big changes is that since 2012 the number of people employed in the UK has risen by 2.5 million and the employment rate has climbed from 71.4 to 75.7 per cent. Significant numbers of people that tend to be out of work (such as single parents, people with lower qualifications, and health problems) have moved into employment. Because these people tend to be paid less (on average) than those already in work we would expect this to lower average pay and repress measured pay growth. In the long-run however, changes in the workforce have tended to boost pay. Over time the share of people with degrees or working in higher-skilled occupations have tended to push up measured pay growth. Figure 4 shows how these two forces have combined to affect the growth rate of average weekly pay over time. The red line shows that the overall compositional effect tends to be positive, occupational upgrading (pink bars) and improvements in qualification levels (dark blue bars) have provided the biggest compositional boosts. Yet more recently wage growth has been dragged down by falls in hours and shifts into lower-paid industries in the aftermath of the crisis (2008 – 2011). Figure 4 also shows that when the employment rate began to rise after 2012 the compositional effect briefly turned negative. Since 2016 the compositional effect has been positive, but, as the Bank of England has argued, the fact that it is below the long-run average means that the changing nature of the workforce is having less of a positive impact than we’ve been used to. How much is pay growth being reduced by this historically-low compositional boost? Annual pay growth would have been an average of 0.3 percentage points higher since 2013 if the compositional effect had been in-line with the historical average. This is significant but fails to fully explain the currently low levels of pay growth, which are around 1.5 percentage points lower than they were before the crisis. It does however give credence to those that argue that nominal wage growth may be rising faster than the headline average figures suggest. If the changing composition of the workforce can only explain a small amount of the post-crisis slowdown in wage growth what is responsible? We can strip away the composition effect by analysing pay growth for those in continuous employment. Figure 5 does this by showing the median pay rise for those remaining in the same job from year-to-year and those remaining in employment but switching jobs. The typical pay rise for someone switching jobs is, on average, around 2.5 times higher than for someone remaining in the same job. 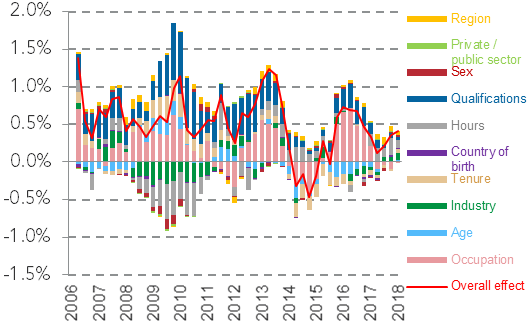 Furthermore, pay growth for those switching jobs is back at pre-crisis levels, whereas the typical pay rise for those staying in the same job is still around a third lower than it was in 2007 and 2008. There has also been a shift in the relative size of these two groups. 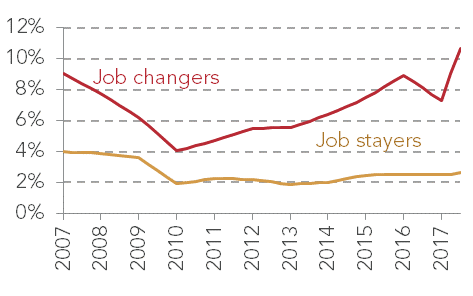 In the decade before the crisis those moving jobs accounted for around 12 per cent of those in employment, in the decade since this has fallen to 9 per cent. There has been a corresponding increase in the share of people remaining with their employer. The subdued rate of job-to-job moves and the fall in the returns to those remaining in the same job are therefore two indicators that would appear to go some way to explaining the subdued level of wage growth. They are also connected: because job-switching has fallen there may be less pressure on firms to pay their staff more to prevent them leaving. Likewise a lack of job-to-job moves may be dampening productivity growth as firms struggle to attract the most suitable workers. A general lack of pay pressure may also discourage firms from investing in labour-saving, productivity enhancing, technologies. For those minded to wait for a higher wage growth Godot to turn up the lack of job-to-job moves may be reason to believe that the productive potential of the economy has still not been reached. On the other hand a lack of dynamism may represent the new economic paradigm we find ourselves in – Godot may already have arrived, and just not be much good.